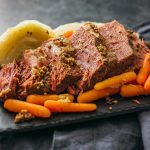 Corned beef has never been easier or faster: try this Instant Pot corned beef recipe with cabbage and carrots, pressure cooked to tender melt-in-your-mouth perfection in under 2 hours. If corned beef is cured, drain and rinse the beef. If uncured, leave as is. Place the corned beef into a pressure cooker such as an Instant Pot, including any spices that came with it. Add water to the pressure cooker pot so that the water level is even with the top of the corned beef, about 5 cups. If the beef is protruding out, use your hands to flatten it by pushing it down. Cover and lock the lid. Select the manual pressure cooking mode and adjust the cooking time to 90 minutes at high pressure. When the pressure cooker is finished, use the quick release handle to release steam pressure and to stop the cooking. Use a fork to test if it easily pierces the thickest part of the beef; if not, cook for another 10 minutes and test again. Without removing the corned beef from the pressure cooker, add cabbage wedges and carrots. Don't overfill past the maximum capacity of your pressure cooker. Cover and lock the lid. Select the manual pressure cooking mode and adjust the cooking time to 5 minutes at high pressure. When the pressure cooker is finished, use the quick release handle to release steam pressure. Take out the vegetables and corned beef. Slice the corned beef against the grain into thick slices and serve with the cabbage and carrots.